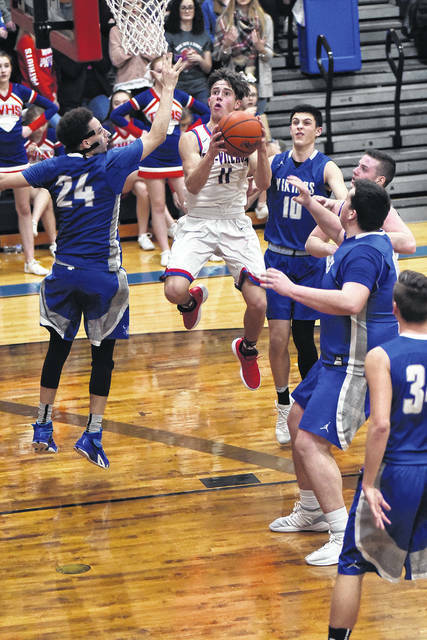 Tri-Village senior Mason Sullenbarger goes up strong to the basket for a score during a Cross County Conference game with Miami East on Tuesday night. The Vikings won the game, 51-42. Tri-Village senior Austin Bruner goes in for a layup during a Cross County Conference game with Miami East on Tuesday night. The Vikings won the game, 51-42. Tri-Village senior Derek Eyer goes in for a score surrounded by several Miami East players during their Cross County Conference game on Tuesday night. The Vikings won the game, 51-42. 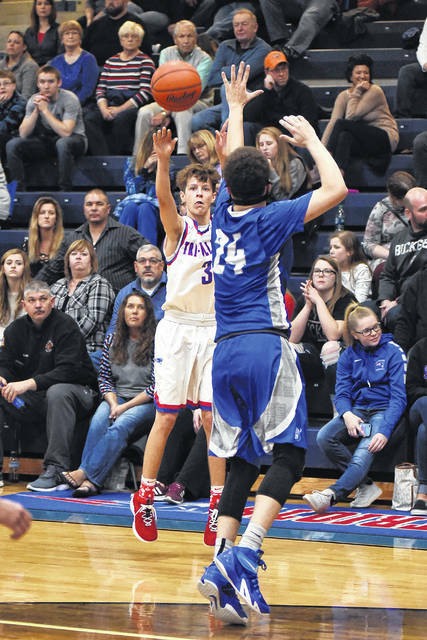 Tri-Village senior Gage Hileman shoots a long 3-pointer during a Cross County Conference game with Miami East on Tuesday night. The Vikings won the game, 51-42. 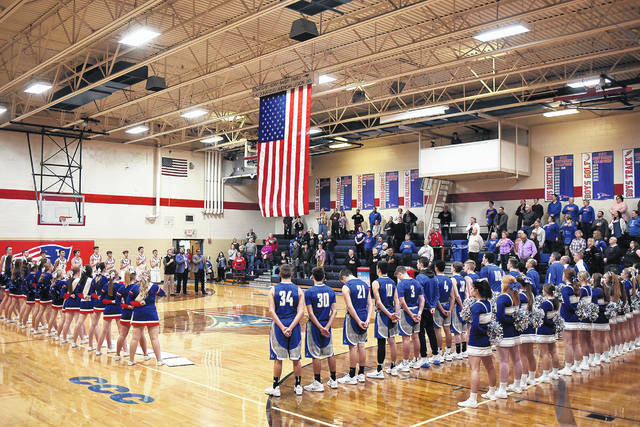 Both Tri-Village and Miami East teams, their cheerleaders and fans stand during the playing of the National Anthem. 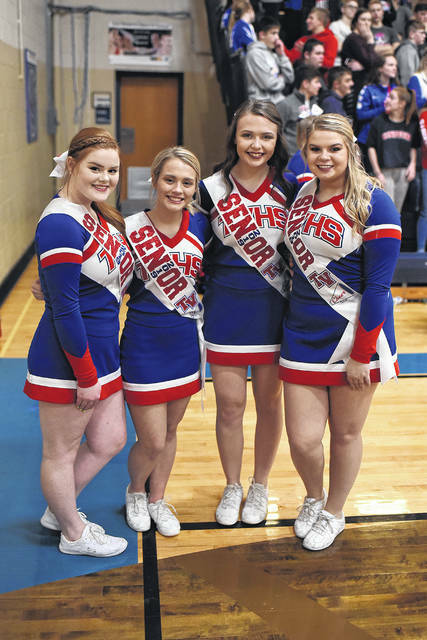 It was Senior Night on Tuesday at Tri-Village and the Patriots seniors cheerleaders took a moment to pose for a photo. Tri-Village senior Austin Bruner tries to score from underneath the basket during a Cross County Conference game with Miami East on Tuesday night. The Vikings won the game, 51-42. 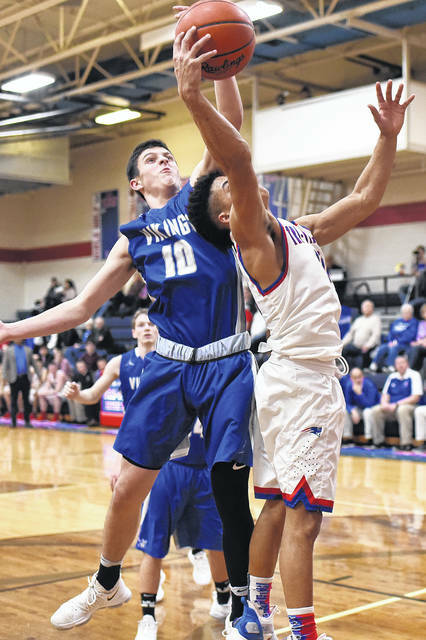 NEW MADISON – The Tri-Village boys basketball team held a 42-41 lead with 2:41 left to play in the fourth quarter over Miami East, but turned the ball over on three straight possessions down the stretch and the Vikings took advantage going on a 10-point run to close out the game with a 51-42 victory. It wasn’t the ending imagined for five senior players recognized on Senior night. Those playing in their last home game were Gage Hileman, Mason Sullenbarger, Austin Bruner, Derek Eyer and Mason Coby. 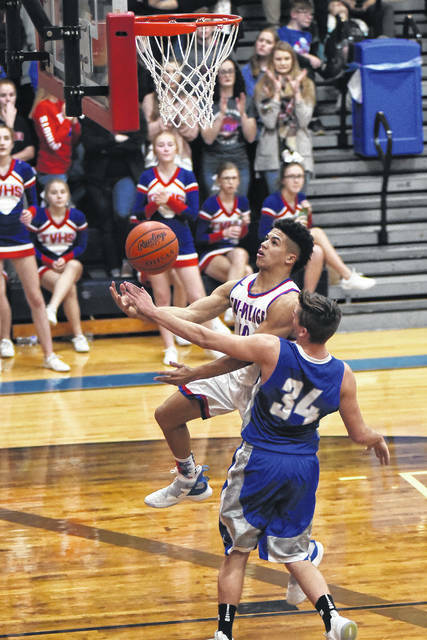 Miami East got off to a quick start in the game jumping out to a 14-7 first quarter lead, as the Patriots struggled – as many teams do – against the Vikings’ zone defense. In the second quarter Eyer was able to attack the zone off the baseline for back-to-back scores at the rim to help spread out the zone. Gage Hileman hit a big triple at 1:20 to narrow the lead down to 20-19. With the score tied at 20, Miami East was playing for the last shot of the half. It missed and Eyer grabbed the carom, took one dribble and heaved a three-quarters court shot that was true and good giving the Patriots a little shot of adrenaline and a 23-20 lead at the break. Offense was limited in the second half. Hileman connected on a trey, then stole the ball for a lay-up to put the home team up 31-26 at 2:14 in the third period. It was the biggest lead of the game for Tri-Village. Miami East senior Will Hudson responded. He hit two straight buckets to end of the third quarter, then hit a triple to start the fourth and the Vikings had the lead again 35-33. He had game-high honors with 18 points. At the 5:20 mark the lead for East grew to 39-35 before Sullenbarger hit a fielder inside followed up by a Layne Sarver stick-back. Moments later he connected on a corner triple giving the Patriots a 1-point lead, 42-41. But that’s when things started to fall apart for the home team failing to execute at a critical time in the game. “We had 14 turnovers tonight and unfortunately three of those were right there at the end where we didn’t value the ball like we should have and that’s what it comes down to. You have to execute every possession especially in a dogfight like this where defense is a premium, and we needed to value the basketball better. We didn’t get it done tonight,” said a disappointed MacKenzie Perry. “We got the movement we wanted against their zone. Derek Eyer did a great job finding the gaps, he was sparking us, there were times we got into the paint and got wide open threes, we just didn’t knock enough of them down. The opportunities were there tonight, you have to make some shots, execute and finish,” Perry added. “We’ve got five seniors who are all great kids and hard workers playing their last home game tonight,” Perry stated. “These five seniors will be successful off the court because I know how hard they work,” Perry concluded. Eyer led the way for Tri-Village with 14 points. Sarver had 13 and Hileman chipped in 10 for the Patriots, who fall to 8-11 overall and 3-7 in the Cross County Conference. Tri-Village will travel to Covington Friday night. Miami East – Mahaney 7, Heim 3, Lawrence 2, Zapadka 9, Whitt 5, Stapleton 3, Hudson 18, Bertsch 4. Totals: 6-11-11/17 – 51. 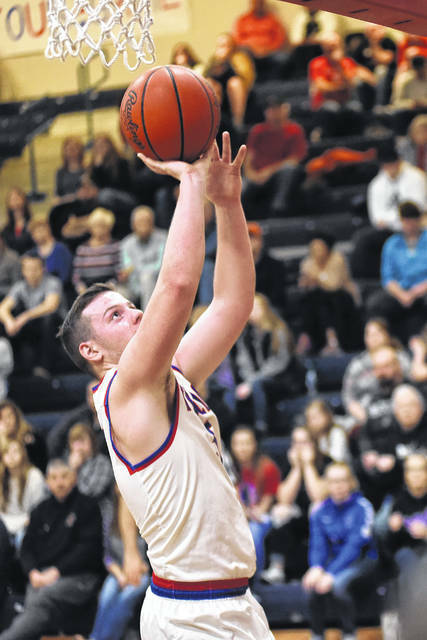 Tri-Village – Hileman 10, Sullenbarger 3, Bruner 2, Eyer 14, Sarver 13. Totals: 5-10-7/12 – 42.